This week at the Dry Tortugas National Park, our birdwatchers were fortunate enough to photograph a couple of preposterously photogenic and very obliging Brown Pelicans; one was an adult, the other was a juvenile. 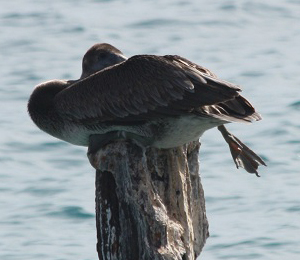 After watching the juvenile laying on an old wooden piling in the water, we decided to focus on this entertaining seabird as our favorite bird of the week. Overall brown with a white belly, the juvenile has a white and gray-brown head. While it is unpatterned during its first winter, in three to four years, it will turn into adult coloring. Being the smallest of the six various species of pelicans, the Brown Pelican can reach a length of about 48 inches with a wingspan of about 84 inches. Known for their prehistoric look and clumsiness on land, it is surprising that this bird has been around for some 30 million years. Located on both coasts of South and North America, the Brown Pelican loves seawater and resting on boats, beaches, mudflats, and piers, and are very rarely seen away from the coast. Since they have become so tame around people and piers, they hang around the fishermen like dogs while they clean their fish begging for leftovers. This seabird spends most of its time on or close to the ocean, feeding on fish in a most unique, but entertaining way. Unlike most pelicans who work in flocks corralling their prey, this species dives head first from such heights as 60 feet into the water scooping up fish close to the surface. These magnificent creatures have air pockets in their body providing a cushion to keep them from breaking their bones. Once they have captured their fish, they tip their head to the side or upward in order to drain the water from their bill pouch. Usually breeding in large colonies of a few hundred pairs, the Brown Pelican's colonies can be discovered in bushes or trees commonly found on estuarine islands. Florida pelicans usually nests in mangroves. Their nests are constructed of leaves on the inside and sticks on the outside. The female will lay between one and three white eggs, with incubation taking up to around 30 days and provided by both adults. The nestlings remain in or close to their nest for about 70 days. For approximately ten days, the female regurgitates fish right into the nest, but after that, the chicks dip into their parent's bills and feed off their regurgitated food by themselves. It takes around six to nine pounds of fish a day to feed three chicks. Sometimes, the parents may have to travel a round trip of about 50 miles to provide food for the family. After about 10 to 12 weeks, the chicks fledge and have to learn to fly and be able to fish on their own in order to stay alive, which is why they have a pretty high mortality rate. With the beautiful weather and the splendid birding we shared this week in Dry Tortugas, it is exciting to anticipate next week's adventures. Come and join in the fun! !